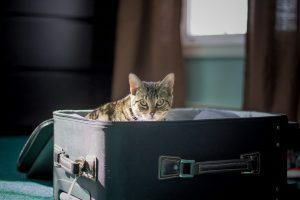 Traveling with pets can be difficult enough, but when traveling for cancer treatment there are additional steps to take. You want to ensure your pet is as relaxed and comfortable as possible. Keep the following tips in mind while packing and traveling. Medications – If your pet is on a medication or the treatment requires a certain medication in advance or following treatment, be sure to carry this with you. Avoid checking any medications or stowing in a location that’s difficult to reach. Comfort items – Your pets are used to a certain level of comfort, so be sure to bring their favorite blankets, dog bed, toys, and other comfort items with you. 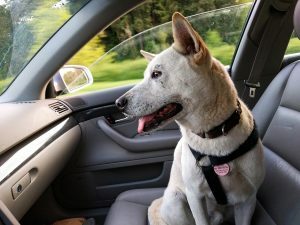 It’s also recommended that you keep pets in a crate or special seat belt to ensure their safety when traveling. Dietary Items – If undergoing anesthesia for treatment your pet will need to fast, but be sure to bring enough portions of their food for the duration of the trip. Pets can be sensitive to foods that are different from their normal diet. Be sure to also bring their favorite treats, as you’ll want to make their experience is as comfortable and positive as possible. Pet Siblings – Some pets are more comfortable when their four-legged companions are with them. Help ease their anxiety and bring their pet sibling along for the ride! Pet-friendly hotel – We are happy to recommend pet-friendly hotels as part of our concierge service. If staying at a hotel outside of our recommendations, be sure to let them know you need a quiet and pet-friendly room. Map the closest ER – We believe it’s better to be over prepared in the event of an emergency. That is why we provide information about the closest emergency veterinary hospital, in case your pet experiences any negative side-effects from treatment. If you need to take your pet to the emergency room, let us know as soon as possible so we can coordinate with the emergency veterinarian to ensure the best possible care. For more information and helpful tips specific to your pet, talk with your veterinarian to come up with a checklist. Has your pet recently been diagnosed with cancer? We’re here for you. Today, PetCure Oncology comprehensive cancer care centers are located in cities across the U.S. We have treated patients from virtually every state. Our network is rapidly expanding as we strive to make this life-saving technology available to as many pets as possible. To speak with a PetCure Pet Advocate team member please call 883-Pet-Hero. Blog Contributor: Diane Wilson, Practice Director at PetCure Oncology at SEVO-Med in Jacksonville, FL.